The New England Library Association (NELA) has come to a close. The final event–not publicized in official documents–was the LibraryThing Conference-Pen Olympics, consisting of Tim taking (sometimes stealing) pens from all the exhibitors and taking them back to the LibraryThing office for a test drive. As regular conference-goers know everyone has pens, but not all pens are created equal. NELA was a low-pen-quality event—no Pilot Precise V5 Rolling balls, no “Wavy Clip Pens.” But some were better than others. Judges evaluated feel, stroke and appearance. Syracuse University wrote well, but twists rather than clicking—life is too short for that. The University of South Carolina achieves a satisfying heft but is too fat to hold comfortably. OCLC’s entrant was cheap–flimsy and blunt, with their logo reduced to black and white–and came with a microprinted “usage policy” on the side, claiming ownership of anything you write with it. Chosen by Loranne for its heft and grippy-thing. The pen advertises some sort of engineering program available from McGraw-Hill. Chosen by Tim, Abby and Matt. Matt described it as “wholesome.” I’m not sure what he means by that. I like it for its satisfying click, smooth writing and decent weight. Advertises Equinox Software, a (rather good) provider of open source ILS systems. As the winner, Equinox will be the first pen Tim destroys by chewing on it. Abby was slated to give a talk about LibraryThing at the Charleston Conference, tomorrow. Then, she came down with the flu. So, I’m heading to Charleston, SC as I blog now. I’ll be speaking at 12:30. Anyone who happens to be there, and can lend me an Apple video dongle gets a free teeshirt. 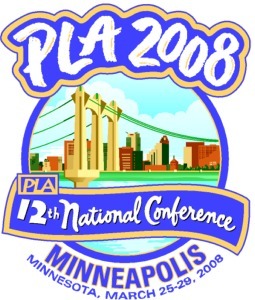 Sonya just iPhoned us the LibraryThing for Libraries booth at PLA in Minneapolis, which is starting now. The rhino has its origin in conference rules that prohibit exhibitors from doing too much of their own setup. At CIL2007 the rule was no more than what one person could carry in one trip, without a hand-truck. Well, what can one person carry that fills up some of a 10×10 space? An inflatable animal, of course! We’re not a “vendor.” Vendors bribe you with tchochkes. They erect gorgeous displays, adorned with orthodontically homogenous and racially diverse “patrons” grinning about some irrelevant, overpriced and boring piece of technology. We are cheap. LibraryThing for Libraries costs what it costs. Sonya’s sleeping with friends and she flew cargo, but we spent a few thousand dollars to own a 10×10 booth for three days. The internet alone cost us $1,000. This is rip-job enough, and some library will be paying for it. If we ordered fancy chairs we’d have to charge them another $500. Who wants that? LibraryThing for Libraries “sells itself.” At first I didn’t even want Sonya to make fliers, for fear some people will grab the flier and not see it for real. Anyway, if you’re at PLA, stop by (booth 1652). If not, but you’re in Portland, ME or Cambridge, MA, send us a note. We might even spring for wine—something we do not skimp on. PS: Even if you have no interest in LibraryThing for Libraries, help Sonya figure out how to make the rhinos roar. It says they do on the box, and there’s some sort of speaker on the foot, but we can’t figure out how. The LibraryThing for Libraries (LTFL) contingent will be at the Public Libraries Association conference this week, holding court in the exhibit hall. Our booth number is #1652, which you should definitely visit if you’re going to be at this fine affair. We’re there to spread the word: recommended reads CAN be in your OPAC. Your patrons SHALL experience the exquisite joy that is tag browsing. You WILL be amazed how easy it is to implement. We’ll be showing off our amazing OPAC enhancement tool, featuring libraries who have implemented LTFL. You can witness firsthand how seamless the enhancements look in WebPac Pro, HIP and others. You’ll know our booth by the giant rhinos.